The Power Module Jr. allows you to have reliable AC and DC power anytime, anywhere! This compact, prewired power unit is silent, completely portable and easy to use. They are perfect for remote places where there is no power! For greater flexibility, add one of our solar charging option and let the power of the sun recharge the battery. There is also a powerful LED lighting option available for the Power Module, Jr. 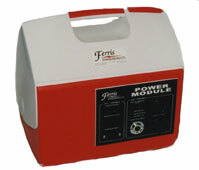 The ultimate in Portable Electric Power and housed in a rugged container with a convenient carrying handle. Contains a 300W AC Outlet, a DC Outlet, 32 Amp/Hr Battery, and AC Charger.